I was on a business trip in the Midwest last week, and K joined me for the following weekend in Chicago, to visit a friend and see the city as my birthday celebration. 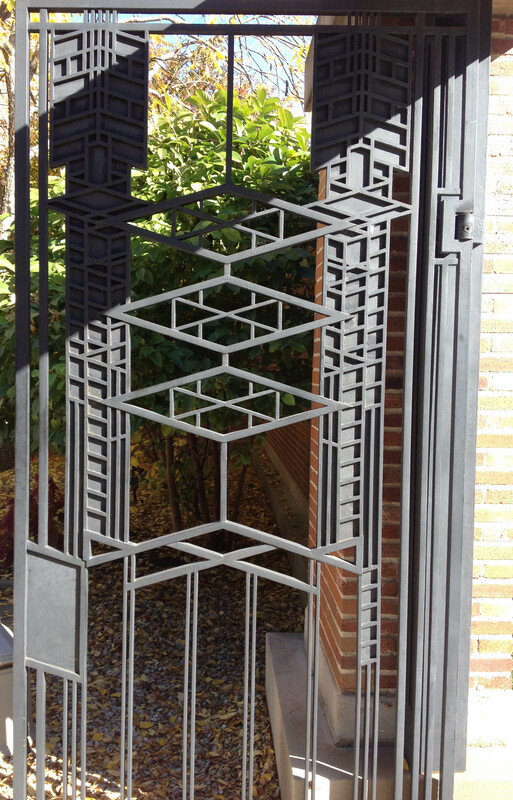 Our top priority was to go tour the Robie House, having been to other Frank Lloyd Wright homes elsewhere. 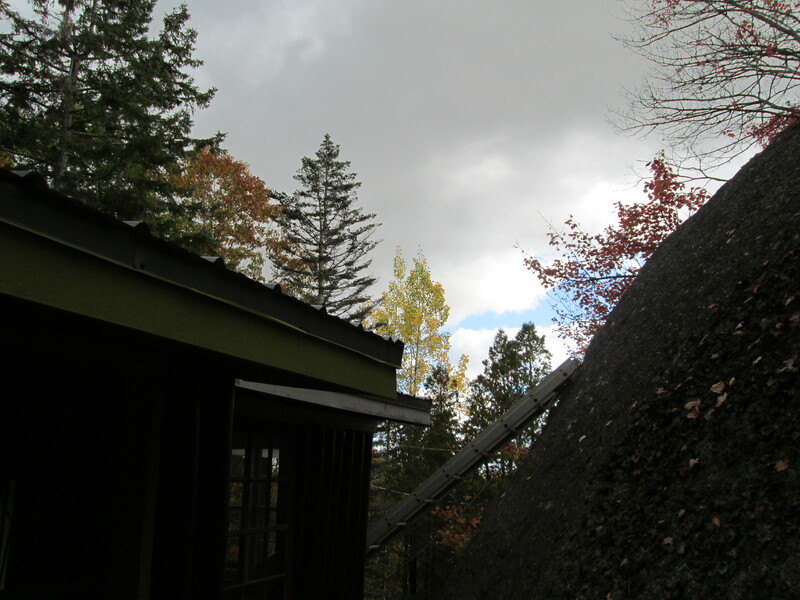 Unlike Taliesin and Taliesin West, Robie was very composed and not so experimental-feeling. It was definitely a very high-level incarnation of his design, and it was AWESOME. We loved it. We also walked up to Millennium Park (a couple of times!) 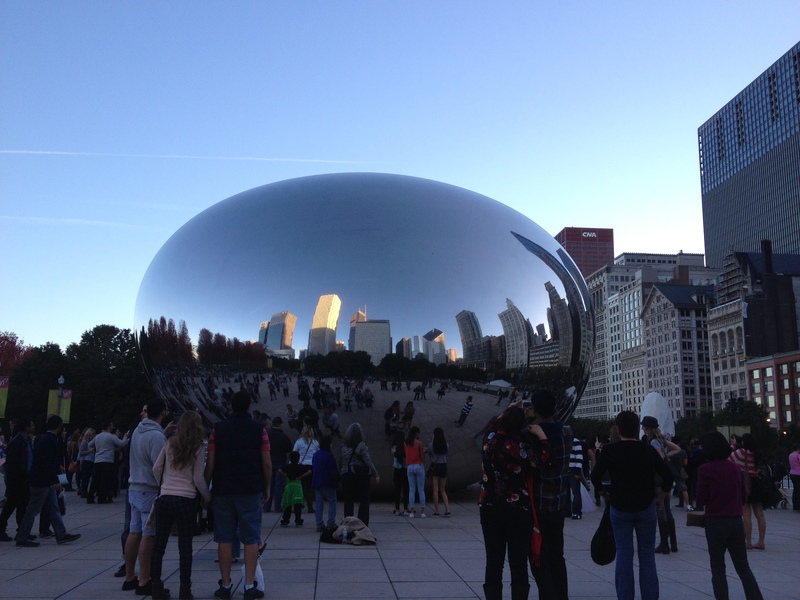 and I was fascinated by The Bean. I have way too many photos of this sculpture. 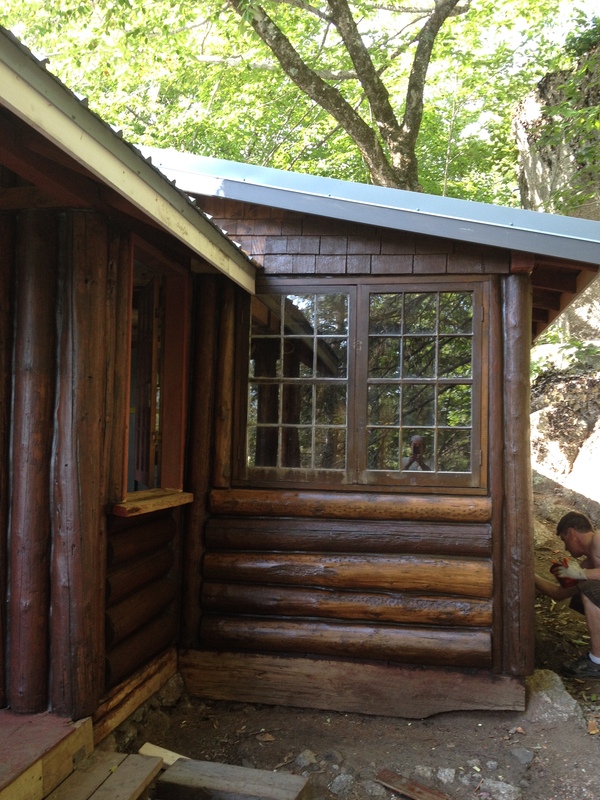 Trying to figure out how to make our own, and wedge it in among the granite boulders at the cabin. 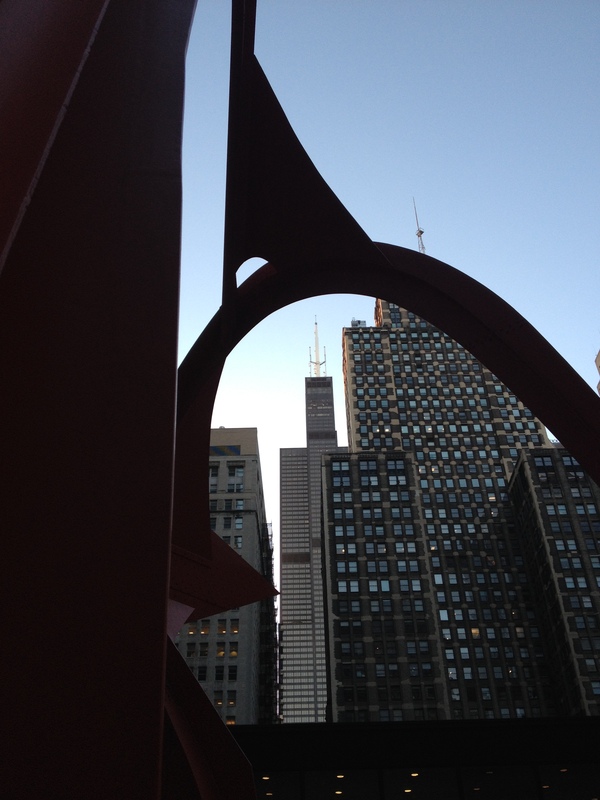 This is the Sears Tower, through an arch of a Calder sculpture. 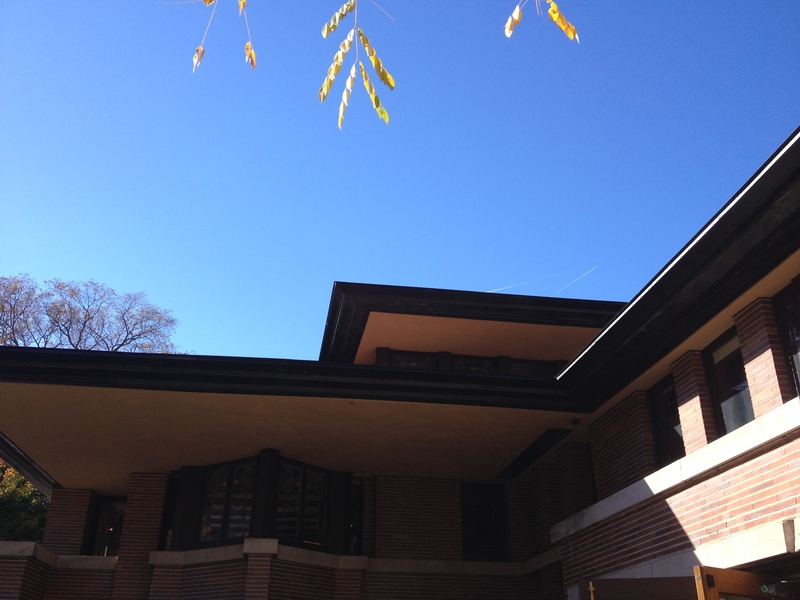 And this is the Library – it melds in perfectly with the older and newer architecture surrounding it. 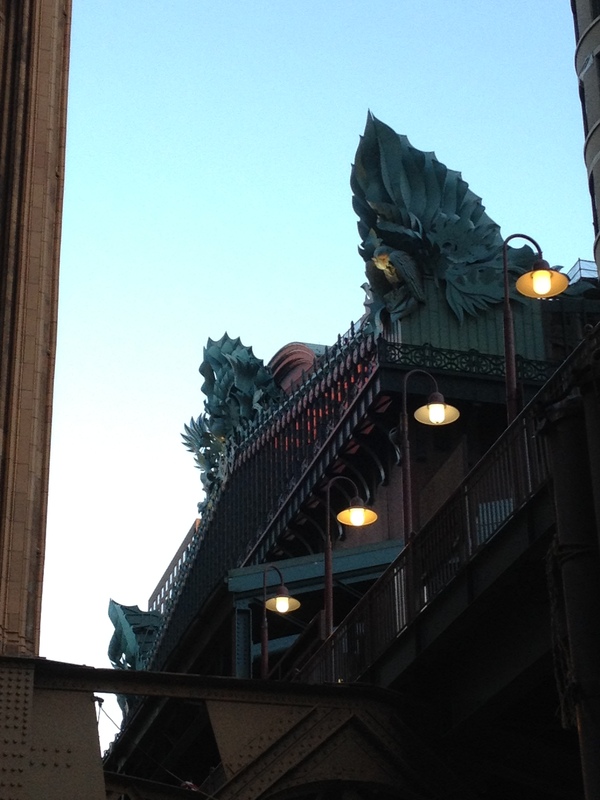 Actually, the entire city of Chicago was a great example of new styles can mix with old, very successfully. 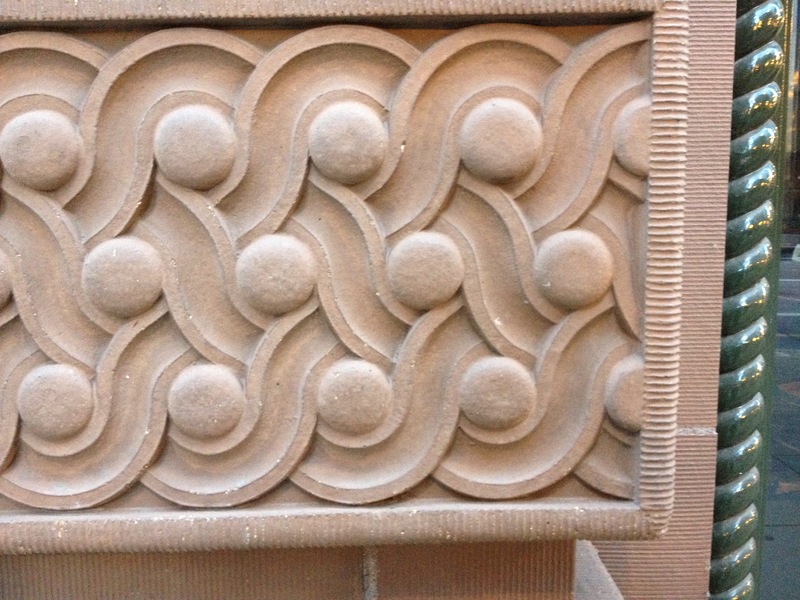 There were so many, so many stone and bronze and brass carvings and ornamentation. Loved this one. And we visited the Field Museum, where among the exhibits (like the most complete T-Rex skeleton), there were great bits of design as well. 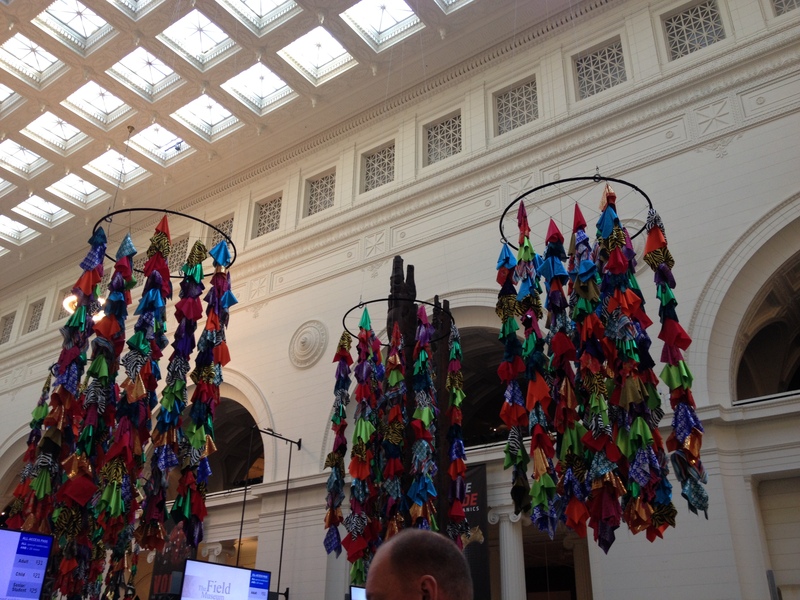 I liked these hanging (huge) cloth-type chandeliers. I think they would be neat hanging from the trees at a backyard party. Heading back to the cabin this weekend. Two windows are ready to go in, the area below. 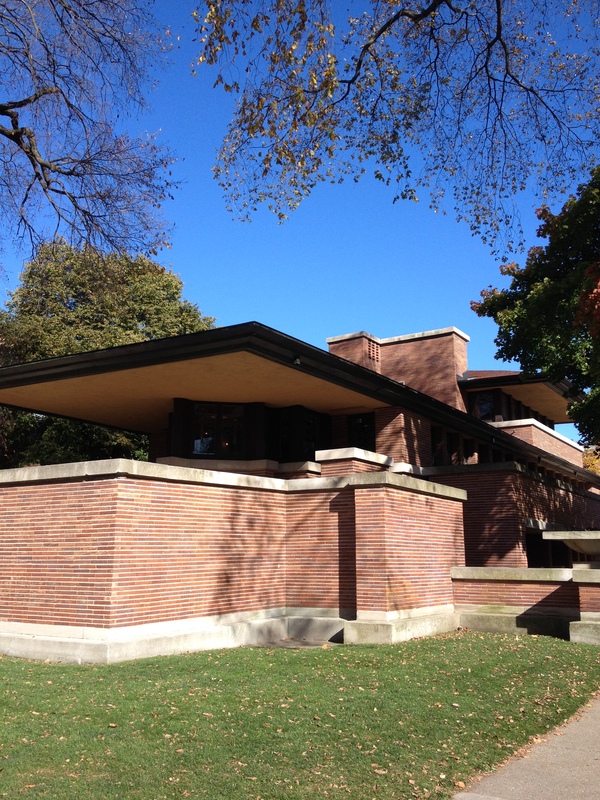 See Frank Lloyd Wright, we have intersecting rooflines and deep overhangs as well! This weekend was the holiday of Sukkot, the festival of huts. One that we’ve not really celebrated before, but it happened (out of pure coincidence) this year. It was a holiday weekend, and basically the first weekend since summer that we’ve been able to take off from work. So we packed up our little camper and went to camp. 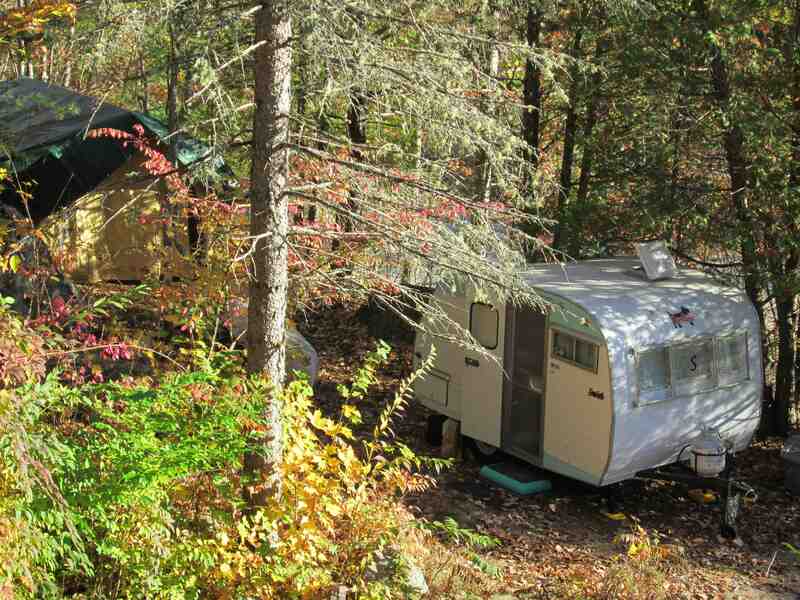 I know – seems silly to stay in a camper at camp, but (1) we love our camper too! 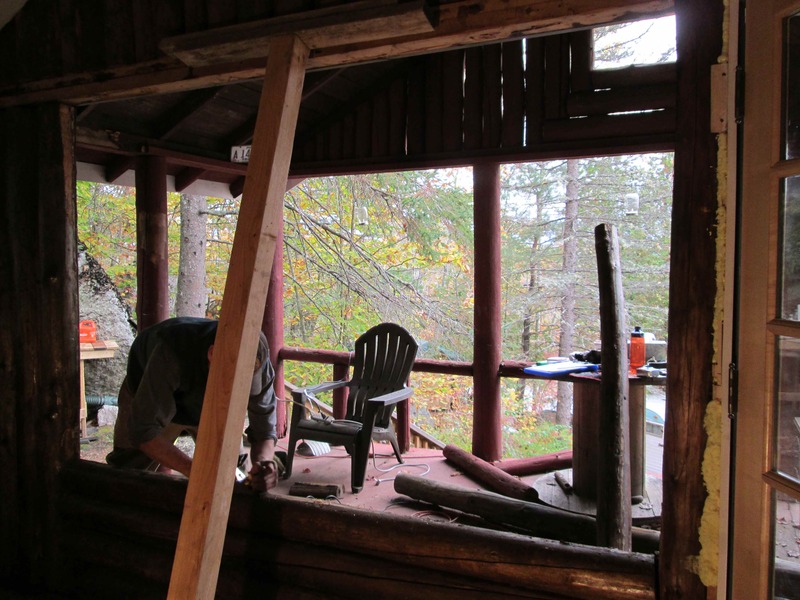 And have not used it enough this year, and (2) one plan for the weekend was to have the cabin doors and windows removed, potentially for a number of days, and we can’t have the dog off-leash in the house without doors. He is far too interested in finding the magical wonderland of chipmunks than sticking around while we are asleep. So we hauled one hut to the other hut, and had ourselves a time. Love our ’65 Scotty! And it looks great from the porch of the cabin. 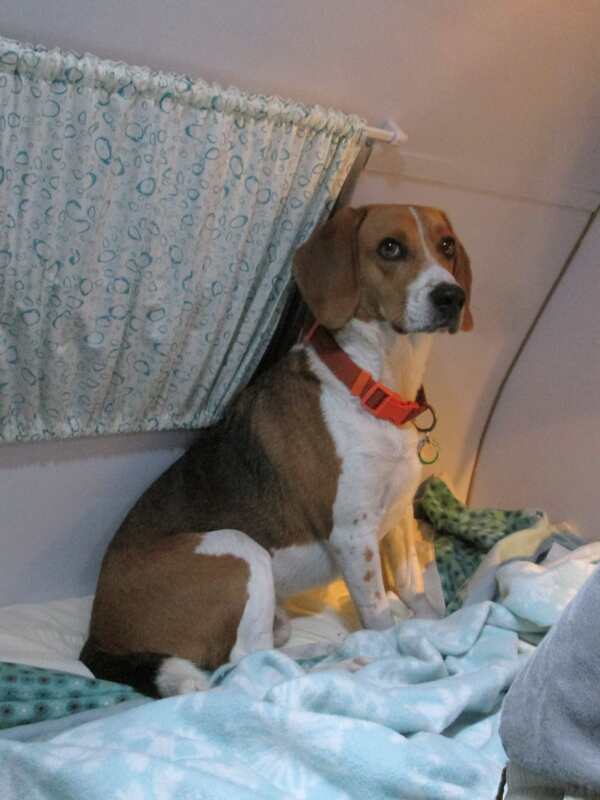 Troublemaker, in bed in the camper. After a long day of chipmunk-stalking. 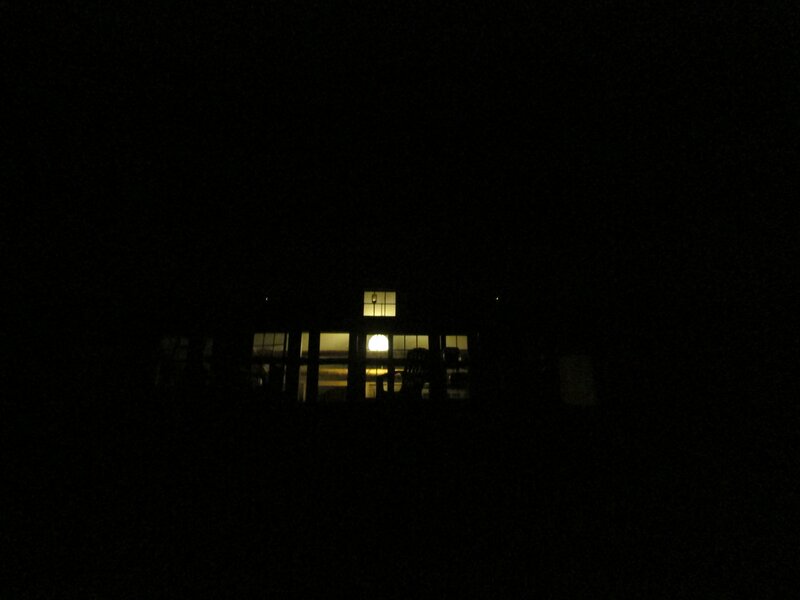 It was tough to get a good photo at night, but the cabin looked totally cool from down below, all lit up. It looked like a western mountain-cabin out on the range, or something. There was work to be done, though. Job 1: replace the large front ‘picture’ window with the newer (yet still old) Andersen picture window we picked up over the summer. Although we love the old barn sashes, and some of the ones in the cabin are really well-made, these were marginally functional. Two never opened, and the one that did opens way out onto the porch – a bit of a hazard. 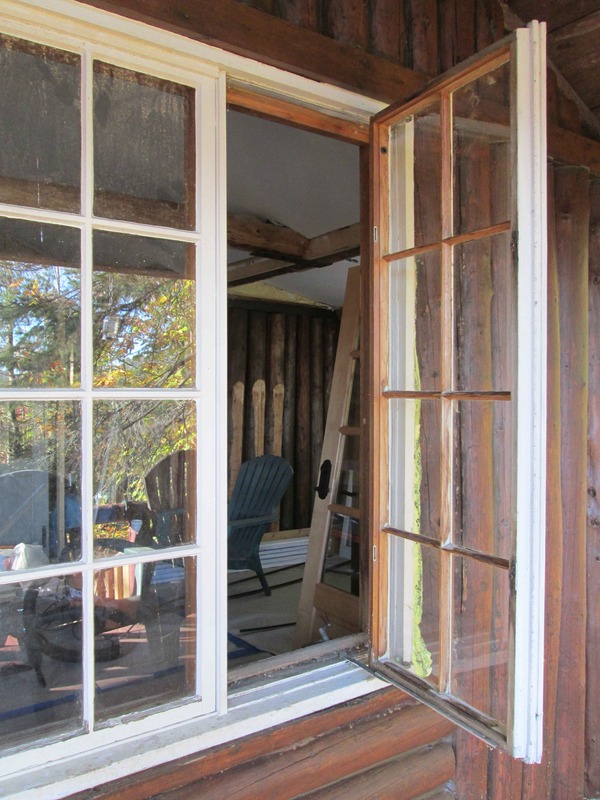 We also wanted to shorten the span here, so the newer window allowed us to add two logs to the front wall and sturdy it up. Window cut out. Yikes – that’s a gaping hole! Cutting our house open again. The view is great this time of year! Window is out, header supported while we engineered some new logs to fill in. 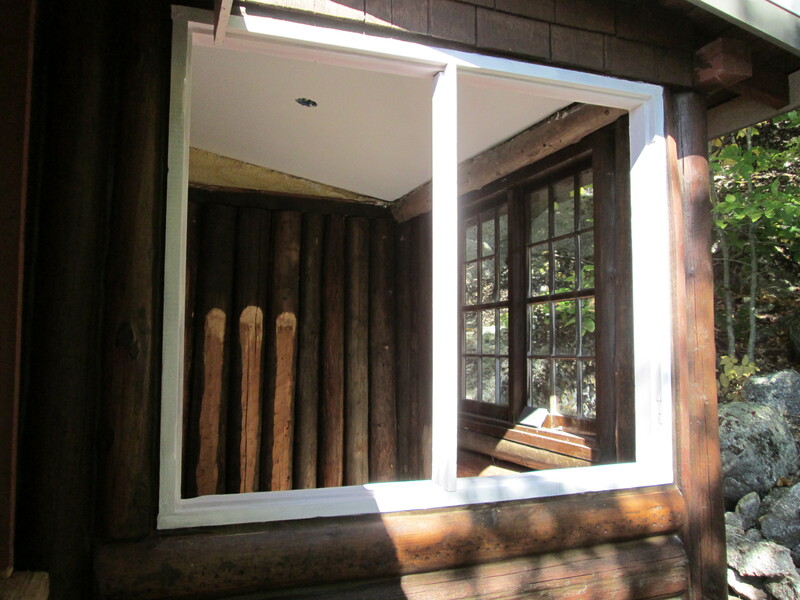 The new window fit amazingly well, with some logs barely needing any work to fit along the sides. 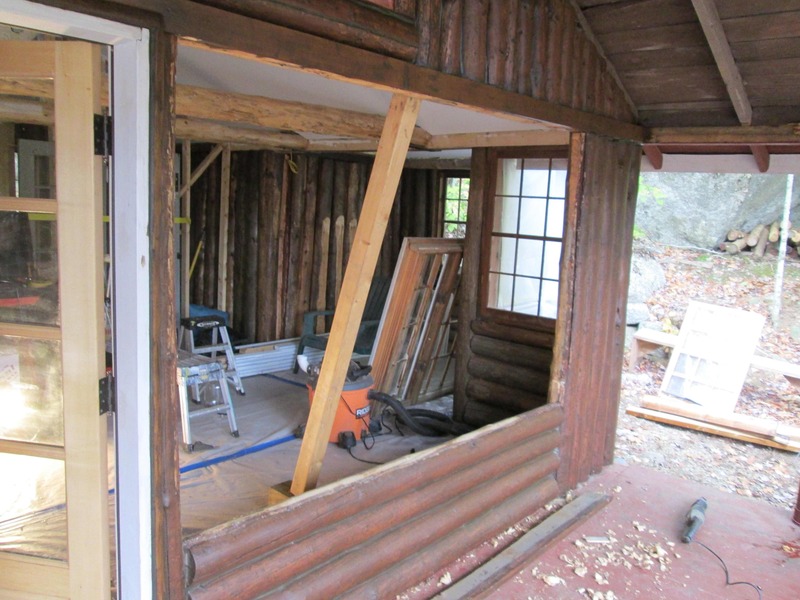 However, the window’s fancy trim really didn’t go with the rest of the cabin, so we cut part of it off to make the frame more coherent with neighboring windows/doors. And here she is! 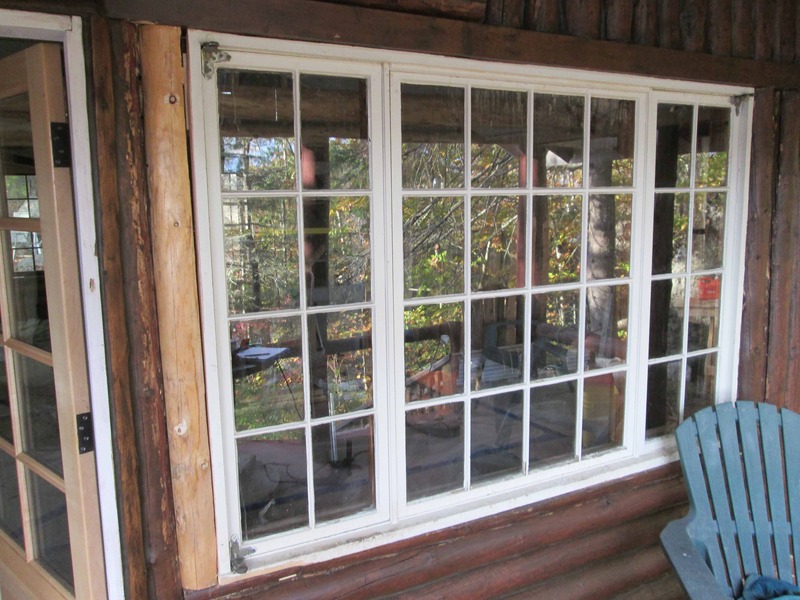 The two side windows open, and the center one is fixed. Even better, this baby has screens AND integrated interior storm windows! A good solution all around. 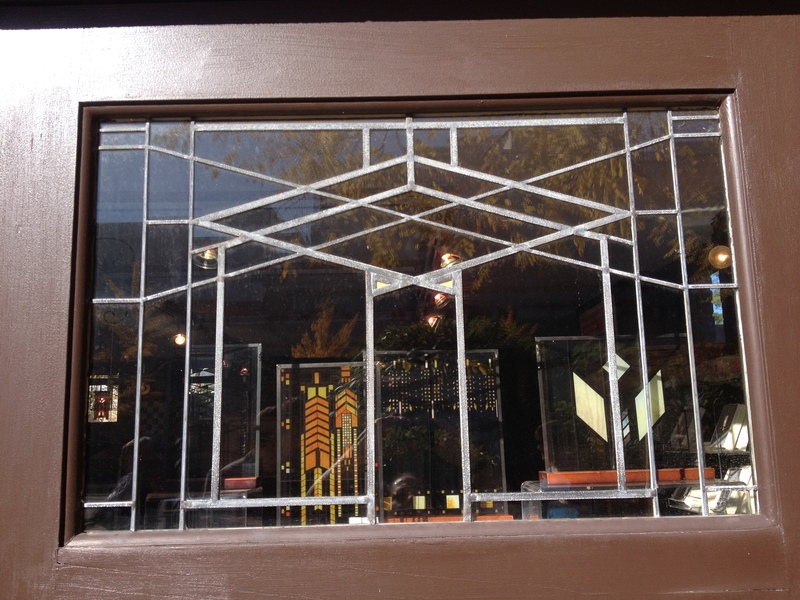 We will repair some glazing and re-paint in the spring, but everything works! 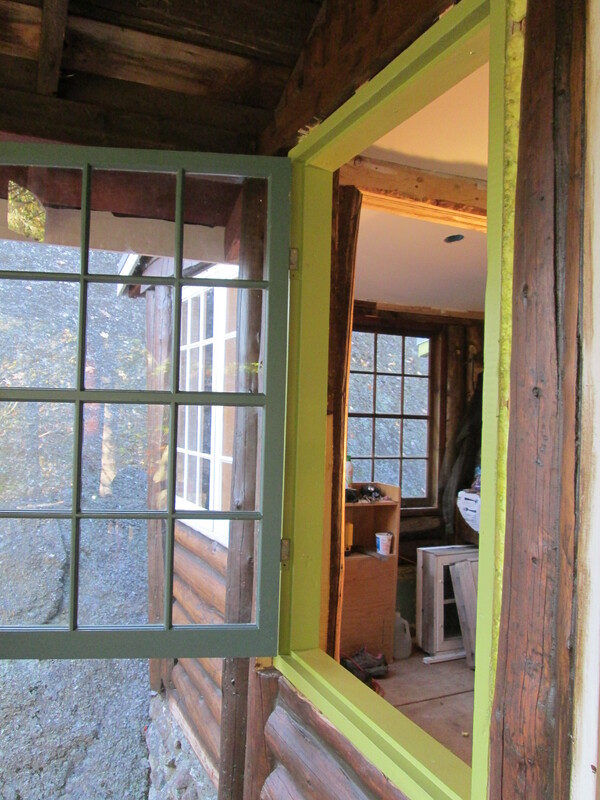 We didn’t only do the window, we also removed both doors and spent the weekend painting the jambs our sassy green trim color. 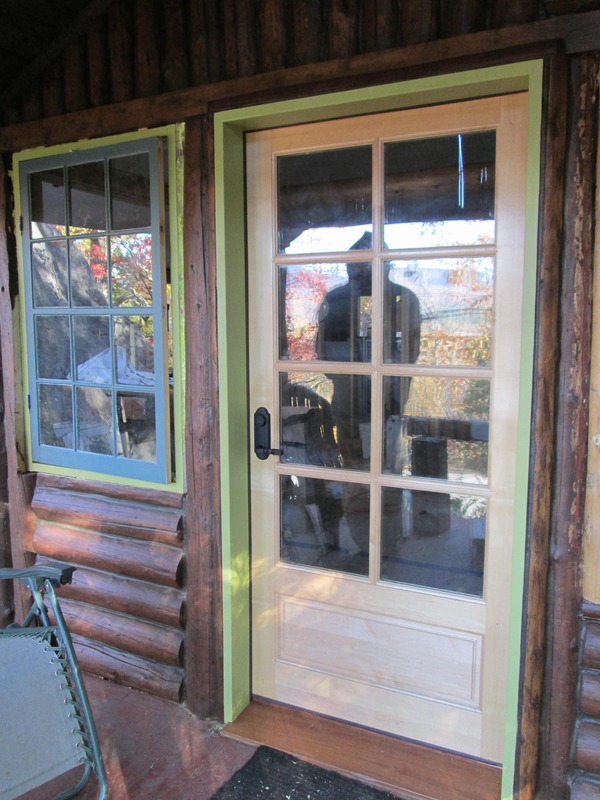 The doors are now 100% done, and look very polished. I also tried out the interior caulking. 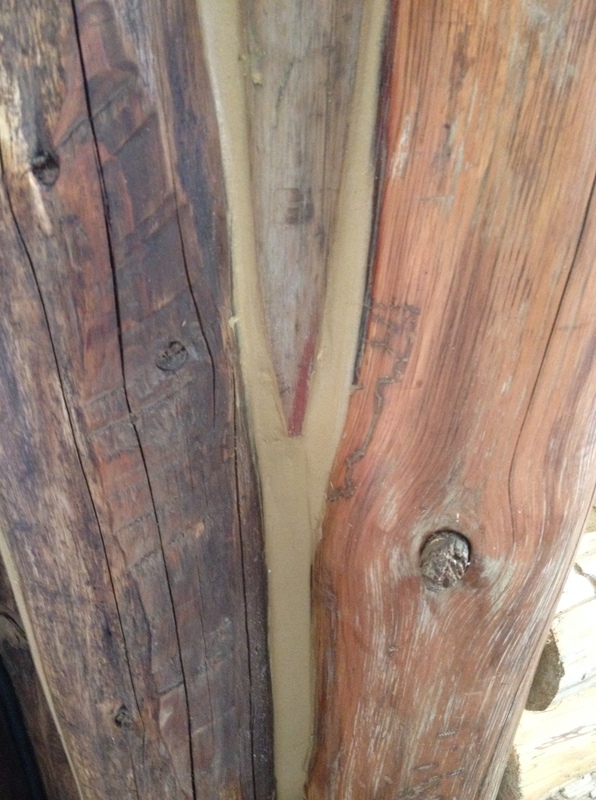 We are again using Conceal, but now in a lighter brown (we want the interior to read as light and bright as possible). Weren’t sure about it at first, but it dried to a a nice color. 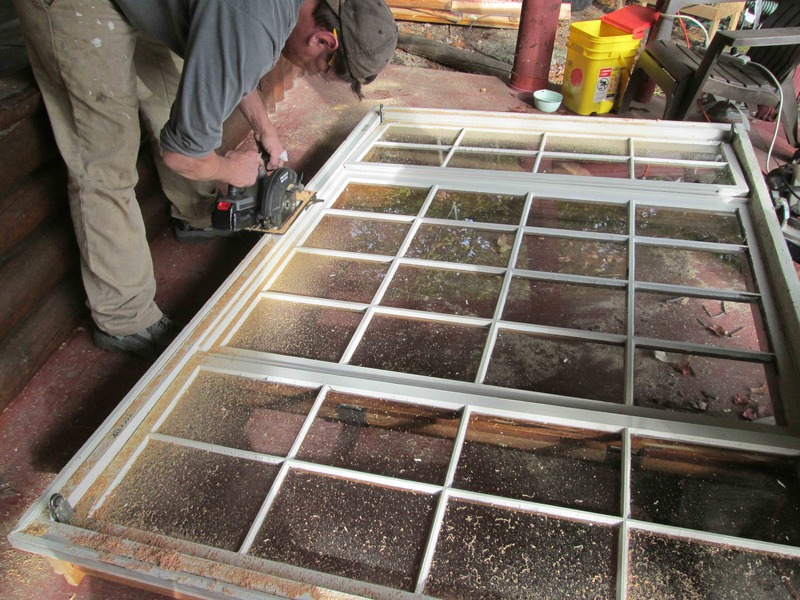 Onward – only about 250 caulk lines to go! And we walked a lot. 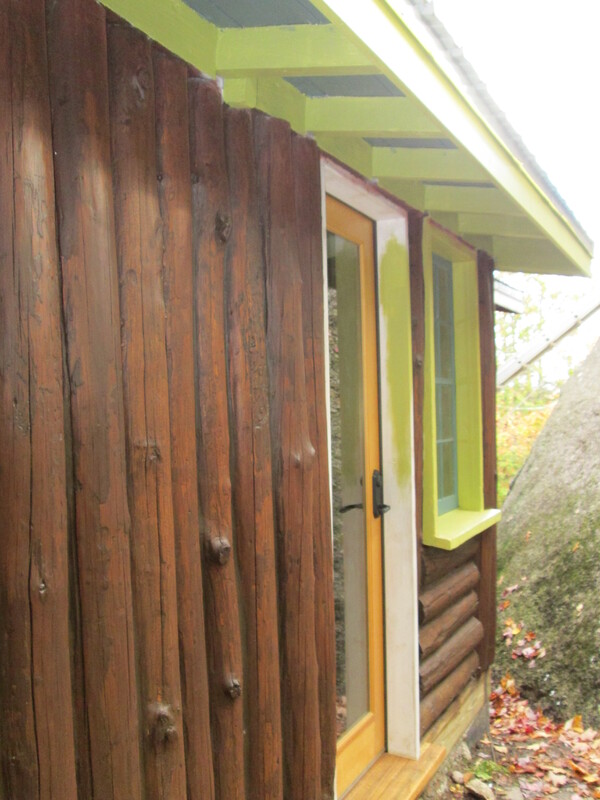 There are many, many other cabins of ours’ vintage around the lake. 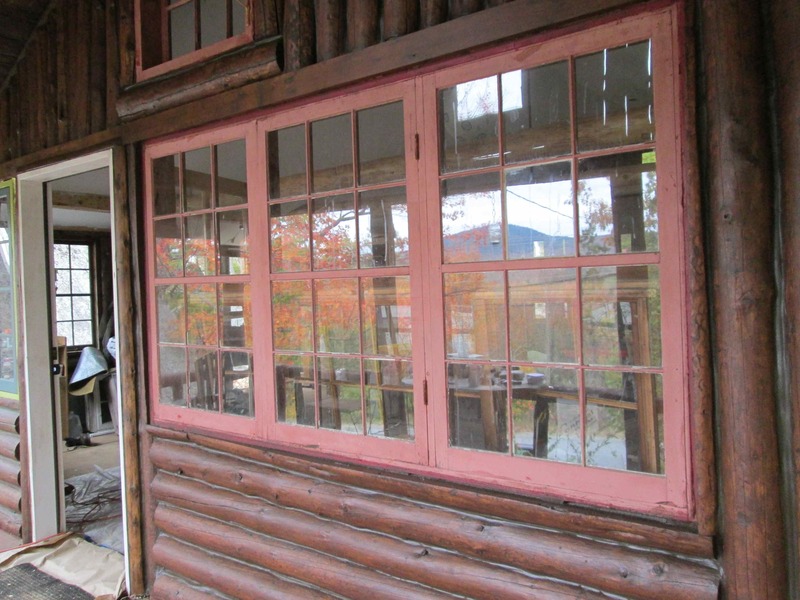 This village was founded as a ‘planned community’ of sorts, and all of the other historic cabins are in various states of repair. 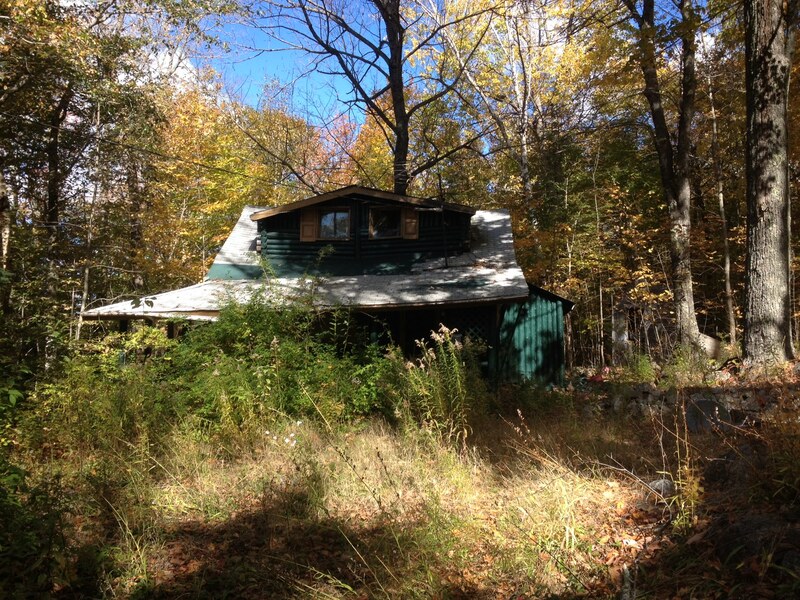 This one is on the “disrepair” end of the spectrum, but is really cute all the same. Hopefully someone will fix it up if salvageable. We had a couple of stupefyingly busy weeks at work, so have not managed much cabin work, but we did sneak in a couple of hours of painting after some big deadlines came and went. K sanded and primed the upper trim and fascia, and what a difference just the primer makes! Then, it quit raining this afternoon (our first day off in quite a while), so we managed to get some color on the fascia/eaves and even got a window installed. I love the colors so far, but we are waiting to get closer to completion for a final thumbs up. 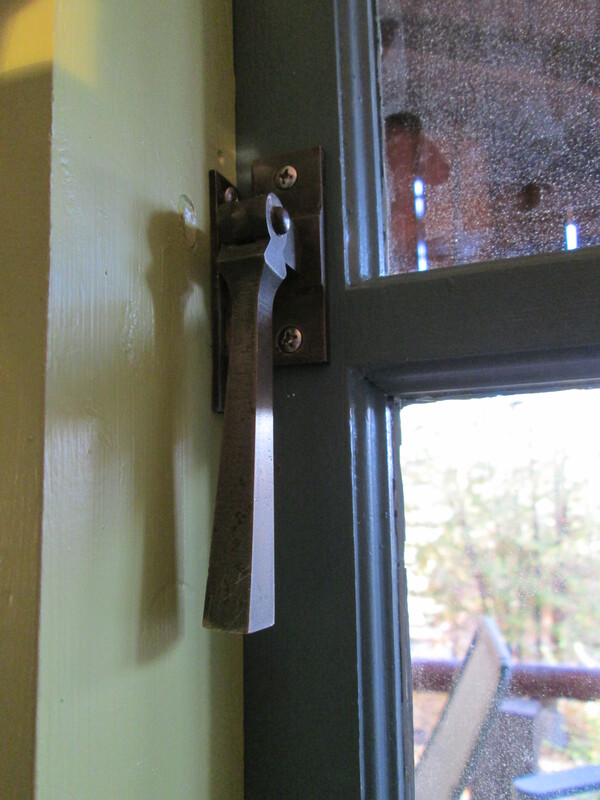 Last weekend – primed a window jamb. 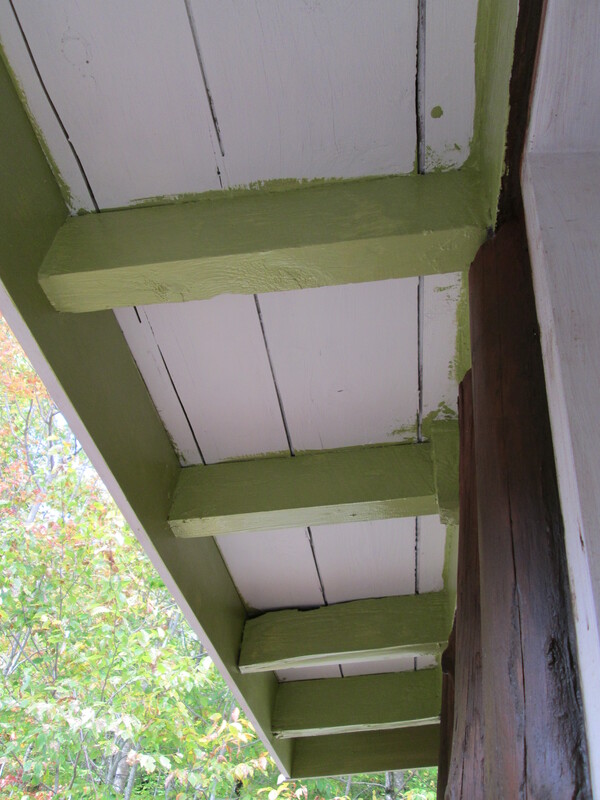 Primer and some paint on the eave & fascia. The sun came out! 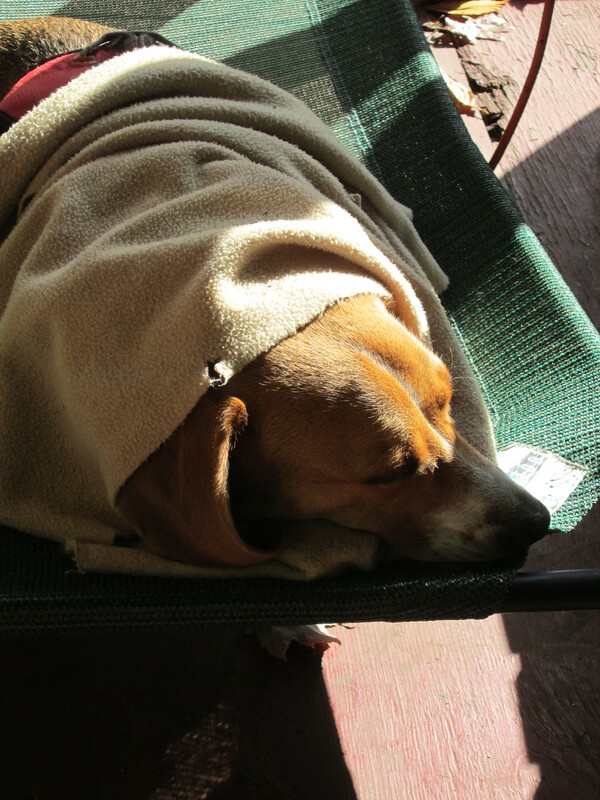 Frankie took advantage of it with an afternoon nap. Fall color is quite complementary to our chosen palette. 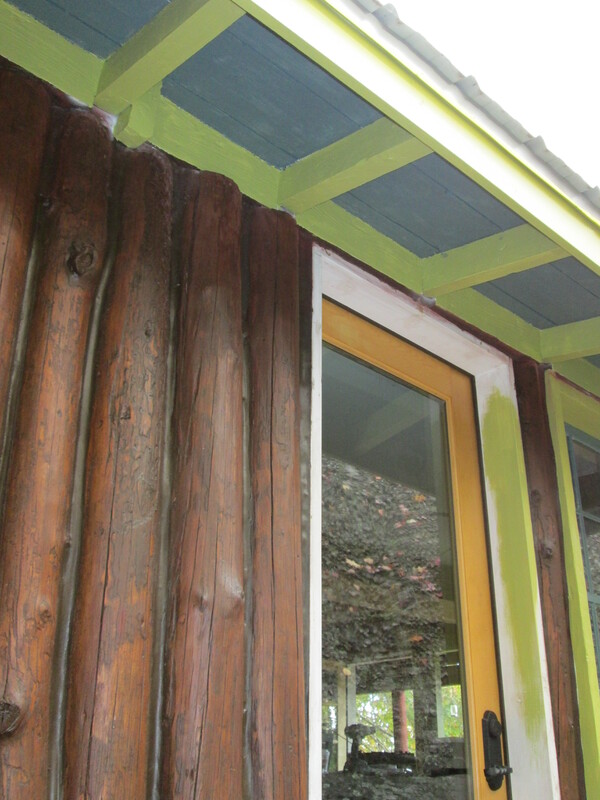 First coat of both proposed trim colors. And a window! No more stapled-up plastic in this location.